One monetary donation can contribute to fighting hunger in Jackson. Did you know that more than 12,000 people in Jackson, Tennessee live every day with hunger as their constant companion? This is a real struggle for many people in our community. But your investment into our mission changes the story of hunger for them. When you give to RIFA, you let thousands of people in need know that there is hope, because someone cares enough to take action. Create a lasting gift to support and sustain RIFA for future generations while maximizing your financial, tax and estate planning goals. Your professional advisor can put together all of the necessary financial and tax-related paperwork to set up your legacy gift. 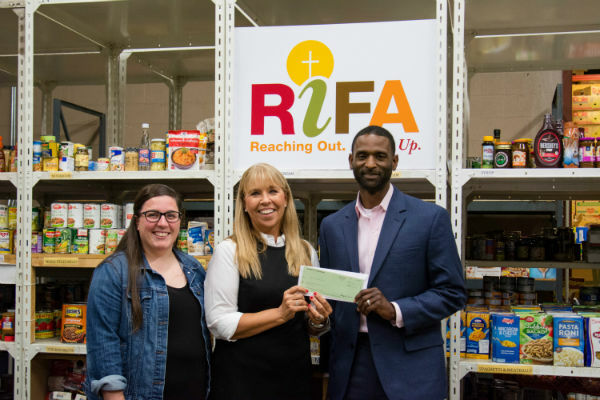 Double the impact of your gift by having your employer match your donation to RIFA. Donate appreciated assets to RIFA and you’ll receive an income tax charitable deduction. Find out how your company can help fight hunger through sponsorship, cause-related marketing and more. Support RIFA when you shop at Smile.Amazon.com. Simply select RIFA as your preferred charity. For further information, call 731.427.7963. RIFA is a refuge for so many.